Home Costs > How Much Does a Gas Fireplace Cost? A gas fireplace will use natural gas, instead of wood, to heat your home. Working similar to a traditional fireplace, a gas fireplace will ignite by simply pressing a button. A gas fireplace, regardless of the type and venting option you purchase, will cost anywhere from as little as $500 to more than $3,500. This will be the price for the fireplace and won’t include any professional installation. The installation will depend on your setup. If you currently have a gas fireplace or you want to convert a wood fireplace, it can be cheaper than installing a fireplace in an area that doesn’t have a fireplace or chimney at all. Plan on spending about $500 to $3,000 to install a gas fireplace. By the time you factor in a quality gas fireplace and the installation, the costs can be in the $4,500 to $7,000 range. BobVila.com notes the average gas fireplace can cost $1,000 to $3,000, and this price will be similar to a wood fireplace. This price range remains the same no matter where you live. Direct Vent $1,000 to $3,500, depending on style, materials and complexity. This fireplace will drill holes in the wall so the fireplace can vent properly. Top-vented $700 to $3,500, depending on the size, materials used and style. This will convert a wood burning to a gas. Vent-free (no chimney required) $200 (simple) to $1,100 (designer). Vented (a chimney will be required $100 (simple) to $600 (for designer). This depends on size and style of logs. When installing a gas fireplace, there are three venting options: a natural vent, direct-vent and vent free. A natural vent, usually referred to as a B vent, will use the present chimney and will exhaust the by-products to the outside by using a flexible liner or a single pipe installed within the chimney. A direct-vent will draw in the outside air for oxidization and will then discharge this air to the outside via a co-linear venting system. This venting system can be vented within the roof or into the side of the home and can be a nice option for those who don’t have a chimney. Lastly, vent-free technology allows you to use a catalytic converter technology to clean the heated oxygen as it leaves the chamber. This technology won’t require a chimney or any sort of venting. Keep in mind that vent-free fireplaces can be illegal in some parts of the United States, so before purchasing one, be sure to check your local state/city code to make sure. Before a gas fireplace can be installed, a chimney inspection will be mandatory and can cost $100 to $200. During this sweep, a professional will be able to clean your chimney and let you know if your chimney is able to accommodate a gas fireplace. While optional, logs may be needed to keep an authentic look. Artificial logs can cost $100 to $1,000, depending on the quality and range. These logs will be made from ceramic or a refractory cement mixture designed to withstand high heat. Most gas fireplaces may already come with logs, while others do not. Adding these logs often add an authentic look and the coal bed beneath can add a fireplace glow. If a gas line needs to be extended to the fireplace, this will be an additional cost to consider. This can cost $200 to more than $1,500 depending on how complicated the connection will be. Like the gas line, if power is needed, an electrical outlet will need to be installed. This can cost $100 to $350. How much does a gas fireplace cost to run? Running a gas fireplace won’t be cheap as it will need either natural gas or propane to run. Depending on the setup you have and which heat source you can use, plan on budgeting at least $0.70 per hour for natural gas or $2.30 per hour for propane. A clear-view or two-window fireplace can cost $300 to $700 more. These fireplaces are designed to be placed in the middle of the room and the cost will be dependent on the style. 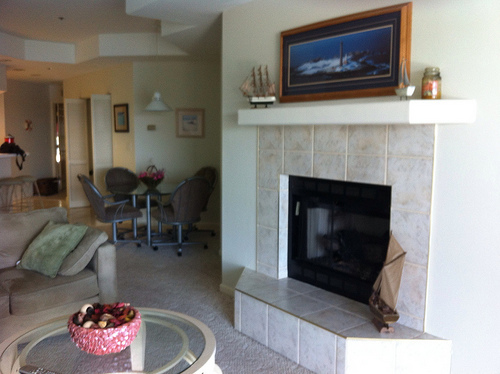 Those building a fireplace will need to consider the finishing options such as the masonry trim, mantel and/or hearth. Depending on the job, it can cost more than $1,000 when the framing, trim and drywall is involved. Depending on your house size, a 40,000 BTU fireplace should be more than enough to heat a living room. To find a qualified contractor in your area, refer to the National Fireplace Institute. Vent-free gas fireplaces may generate the utmost heat, but as Angie’s List points out, it may introduce unburned combustion products into your home. Because of this, it isn’t recommended for those who have allergies or asthma. If you already have a chimney, consider a vented fireplace since it’s simple to install and a contractor can use your existing chimney. Those who don’t have a chimney should consider using either a vented or vent-free option. A fully vented fireplace will need to have a similar to setup to a wood burning fireplace. Since gas can’t be burned clean, a damper will have to open to allow the fumes to escape the chimney. Compared to a ventless flame, a vented gas fireplace will have a “yellower” flame, making it look more realistic. The flame is also taller in size. As the flame burns, it can wrap around the wood, creating a realistic effect. Since it has a chimney, most smells will escape. Less heat will be produced since a lot of it can escape. Compared to ventless, it can use a bit more gas, increasing your gas bill. Ventless gas logs won’t have a vent, hence the name “ventless.” These fireplaces have specially designed burners to burn gas cleanly with no exhaust, similar to how a kitchen range works. This fireplace can be burned with the damper closed. Compared to a vented, it can trap the heat, allowing you to use less heat. It will also use less pollution since no fumes can escape the chimney. Ventless fireplace inserts can create mold or mildew since, in order to burn the gas, the fireplace will have to use carbon dioxide and water vapor. A window will have to be opened if it’s used for more than one hour since you will have to replenish the oxygen being burned by the fireplace. The smell, according to some people, can produce a smell that’s similar to kerosene. It can also cause eye irritation to those who are sensitive. They won’t be legal in some municipalities. Because the gas has to be burned cleanly, the flame height can be very low and will appear less lofty. BTU limits will apply, and this will depend on the amount of cubic feet available in the room. When hiring any contractor, try to get at least three quotes. Most contractors will be more than happy to come out and offer a quote for no charge. To get quotes delivered straight to your email inbox, consider using HomeAdvisor.com – it’s free.